We all have dreams, some more imaginative and complex than others, but we all have them. For some people a dream is not meant to be chased after if it isn’t realistic, but for others it is important to always follow your dreams. 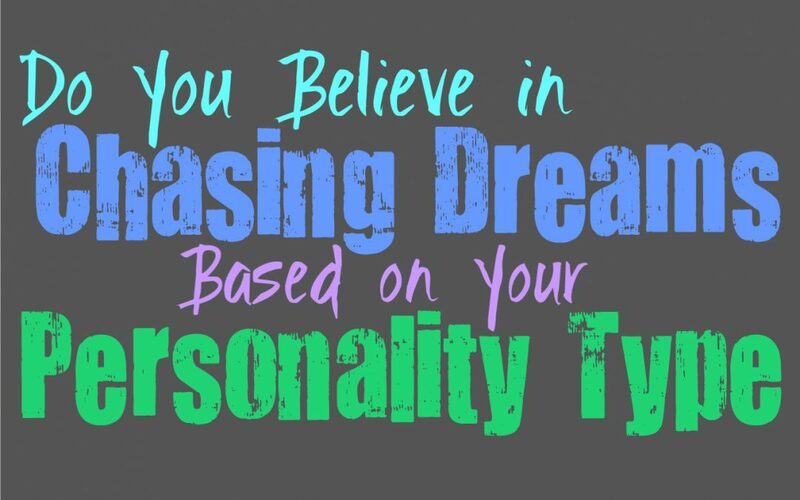 Here is how much you believe in chasing your dreams, based on your personality type. INFJs can be both practical and dreamers at the same time, which leaves their heart and head battling against one another. While INFJs can sometimes be fearful of really going after their dreams, deep down they do believe in them. They might be fearful of taking risks themselves, but at the same time they always encourage their loved ones to follow their dreams. INFJs simply fear failure because the pain from not being able to succeed can be truly great for them. This can sometimes hold them back from following their dreams, even though in their hearts they believe people should chase their own desires. ENFJs often believe in going after their dreams, but they combine this with a sense of practicality. They believe in being realistic and finding the best and smartest way to achieve their dreams and goals in life. ENFJs often combine these things they want with a sense of reality, and do their best to work hard to achieve all of this. They don’t want to disappoint their loved ones and so sometimes they can put their deeper dreams aside for the sake of those closest to them. At the same time ENFJs will stand by the people they love and always support their dreams and help them to achieve them. INFPs are dreamers by nature, and always have so many beautiful things they wish to achieve and experience. Their minds are so filled with hopes, dreams and desperate wishes, and so for INFPs these things are deeply important. While not all of their dreams become goals they wish to pursue, they do believe in going after the ones hey truly want. Sometimes INFPs can lack the sincere motivation to press forward, but that doesn’t mean they don’t believe in chasing dreams whenever possible. ENFPs are definitely dreamers and so they certainly believe in chasing their dreams and deepest desires. For the ENFP it is important to have people who support them and don’t try to stop them from going after what they want in life. While some people might be afraid that chasing dreams isn’t practical, ENFPs rarely agree with this type of thinking. They don’t like feeling held back by what seems impossible, instead they believe that they should always go after the things they want in life. While INTJs believe in going after their goals, they sometimes hold off on certain unrealistic dreams. INTJs are practical and logical people, and so sometimes they can accept that dreams aren’t always going to be made reality. They often assess these inner desires and try to analyze whether or not going after them makes any sense at all. This doesn’t mean INTJs don’t believe that dreams are valuable, they simply don’t think that everything one imagines should become their biggest goals in life. ENTJs are very goal-oriented people who will do anything to get what they want in life. For them it is important to chase certain dreams and not just let them go to waste. At the same time ENTJs are realistic people who don’t like wasting their time going after something that won’t ever come to fruition. While they often have big dreams for the ENTJ it is important to be capable of turning them into a reality. They often assess their capabilities and if they can put together a plan which will gain them the results they are hoping for the in the end. While INTPs are seen as logical and sometimes cold people, in truth they are some of the biggest dreamers you will meet. They certainly believe in going after their dreams, and want to support their loves ones in their efforts as well. At the same time INTPs combine these lofty dreams with a sense of logic and facts, and this can make them seem much less like true dreamers. They simply want to be able to find ways to temper their expectations, since they realize that sometimes people are let down when things don’t go as they expected. ENTPs are logical dreamers, who certainly believe in chasing after what they imagine and want in life. They don’t let their doubts stand in the way, since they realize that even in failure they can often learn and experience so much. ENTPs want to be able to really figure out how everything around them works, and so they do believe in chasing after even the craziest of dreams. For the ENTP it is best to be around people who support their sense of imagination, rather than trying to snuff out that inner light of theirs. While ISTJs might have big dreams, they are very practical and reasonable people. They believe that only certain dreams should really be chased after, and those are the ones which make sense. They don’t like working towards something which can never come to fruition in the way they want, since this disappointment can be truly unsettling for them. ISTJs simply want to be sure that they are capable of achieving their dreams before they invest their hard work and energy into making them come true. ESTJs are very practical people, but they are also extremely goal-oriented. If they want something bad enough they believe in doing whatever it takes to make this come true. ESTJs don’t want to chase after any dreams which are unrealistic and would simply lead to failure, but in most situations they can find a logical solution to what they want. Most of their dreams are things they deem within reach, and so they work hard to make these dreams come true and become a part of their reality. ISFJs are very practical people and often their dreams are rather simple goals. They might possess some deeper dreams which they keep to themselves and have kept in the corner of their mind. For the ISFJ their dreams can often be put aside for the sake of being practical and taking care of more realistic goals. They often find themselves setting aside these more fanciful thoughts, since they want to be sure they don’t let anyone down who is depending on them and their ability to get things done. ESFJs often have more dreams deep inside of them than most people realize, since they can keep these dreams to themselves sometimes. They might be afraid of failing or of taking chances that might let their loved ones down. When the ESFJ is younger they are much more likely to believe in chasing dreams, but as they get older this can prove to be more challenging for them. They might start to put aside their own wishes and dreams in order to take care of their loved ones and live more practical lives. At the same time ESFJs almost always find themselves in full support of their loved ones and want to help them chase after their dreams. ISTPs are realistic and logical people, and so they don’t believe that all dreams should be pursued. If the dream makes little sense and seems completely improbable, they might not want to invest their energy into this. At the same time ISTPs don’t believe in trying to hold people back and will enjoy letting them go after what they want in life. ISTPs do have some dreams they want to make into a reality, but they want to be sure to use their heads instead of allowing their emotions to cloud their judgement. ESTPs are often practical people who believe in going after the things they want, but in a more realistic way. They do believe in seeking out the things that excite them, but they don’t want to become too caught up in dreams that make little sense. ESTPs often combine their dreamy side with their more logical side, in order to figure out which dreams they want to make into sincere goals. They are capable of working hard and going after what they want, but at the same time they like to chase after more tangible things. ISFPs definitely believe in chasing their dreams, but they often have so many of them. They can imagine themselves in so many lives and so many places, that sometimes it becomes difficult to decide which dream they really want to make a reality. They are imaginative people who seek out the things that bring them joy and fulfill their hearts in unique ways. For the ISFP it can be hard to remain stagnant, and so they often find themselves chasing many dreams at once. ESFPs are naturally dreamers and so they certainly believe in chasing after whatever desires they possess. ESFPs don’t like allowing fear or even practicality to stand in their way when it comes to going after what they want. When the ESFP has a dream that means a lot to them, they won’t allow anything to stand in their way. They might take a while to really unearth some of their dreams and desires, but when they do the ESFP will fight for what they want and believe in.